Backflow Testers: We now have the test report form for FREE! No need to purchase the books any longer. It’s the same form I’m selling below! The form is a fillable PDF. This means you can save it to your computer and then email it to the customer, the utility and yourself. Add your personal information once and save it to the form. Never have to add your personal info to a backflow form again. 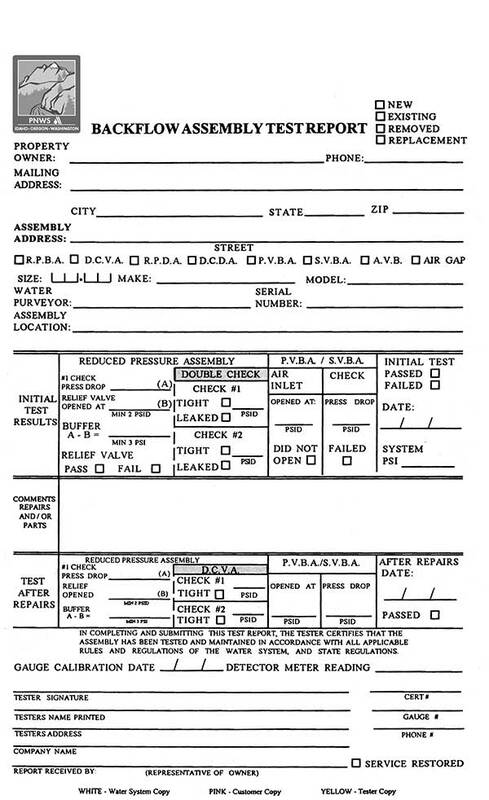 You can even take this form to your local printer and have them create your own test report forms with your personal information printed on the forms. It’s Free and it has more space for you to write on! Notice:PayPal is experiencing a random error that occasionally declines your card. It has nothing to do with your bank. If this happens to you – Try Another Card and it will work. All PNWS items are shipped via UPS. Please note that we cannot ship to PO BOX addresses.